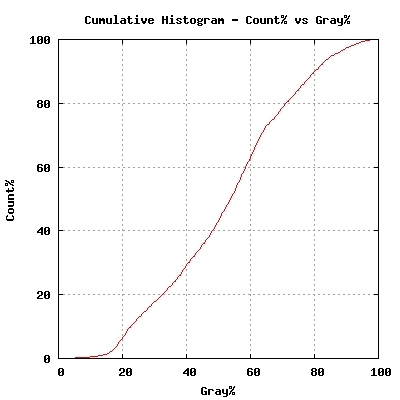 Creates the combined grayscale cumulative histogram of one or more images. .................. processed. The default is no progress report. 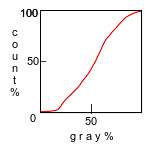 PURPOSE: To create the combined grayscale cumulative histogram of one or more images. 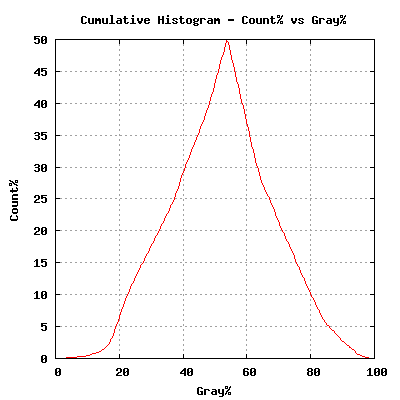 DESCRIPTION: CUMHIST creates the combined 256 bin grayscale cumulative histogram of one or more images. The results are listed to the terminal and optionally may be graphed. Images may be provided as a list in the command line or by providing a path to the image directory containing the images to be processed. -f format ... FORMAT is the grayscale image format to use for processing. Choices are: normal (n), ave (a) or global (g). The default=gray. For format=normal, the R,B,B channnels will be converted to -colorspace gray. For format=ave, the R,G,B channels will be average. For format=global, the R,G,B channels will be appended. -L ... use LINEAR channels. The default is non-linear channels. -C ... COMPLEMENT the cumulative histogram percent counts above 50%. That for those percent counts above 50% convert them to (100-50)%. 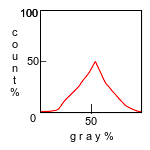 The default is a normal (non-complemented) cumulative histogram. -g graph ... GRAPH is the type of graph to create. Choices are: simple (s) or gnuplot (g). The default is no graph. -m mode ... MODE for the graph. Choices are: view (v) or save (s). The default=view, if a graph is requested. If mode=save, then an output image named cumhist_graph.png will be created. -P ... PROGRESS report showing the list of images as they are processed. The default is no progress report. -i imgdir ... IMGDIR is the (full) path to directory of images to be processed. If images are provided in the command line, this option will be ignored.